Like the Mexican pastry, churro waffles are coated in cinnamon sugar and drizzled with dulce de leche sauce. Enjoy for an indulgent breakfast, brunch or dessert! A few months ago, I got an email from one of those “deal of the day” sites that they were offering Cuisinart small kitchen electrics at a deep discount. I own most of the common small kitchen electrics already, but compared the price of the waffle maker to other regular online retailers, and while the discount wasn’t quite as steep as they’d have you believe, it still was cheaper than other retailers, even with the cost of shipping. Well, by happy circumstance, just days after my waffle maker, a new Sunday Supper theme was announced — waffles! With my small apartment and next to no kitchen storage, I try to limit my cooking purchases to those that can perform more than one task. But I love homemade waffles, and simply couldn’t resist. If we have nothing to do on a weekend morning, and if I get up early enough, I start the coffeemaker, and make a special breakfast. Even with all the flavor options available, we’ve been growing tired of alternating between pancakes and French toast. Sometimes I’ll make eggs, but our 4-year-old doesn’t seem to be a big fan. Of course, the 4-year-old is perfectly happy to have a stick of string cheese, and a yogurt as his breakfast, then snack throughout the rest of the morning. So really, this indulgence of a special weekend breakfast is mostly for me and Dave. I don’t know if these churro waffles are better suited for breakfast or dessert, but they are delicious. The batter itself is lightly spiced with cinnamon. Then, the cooked waffles are lightly brushed with melted butter, then sprinkled with cinnamon sugar (the butter helps the sugar stick). 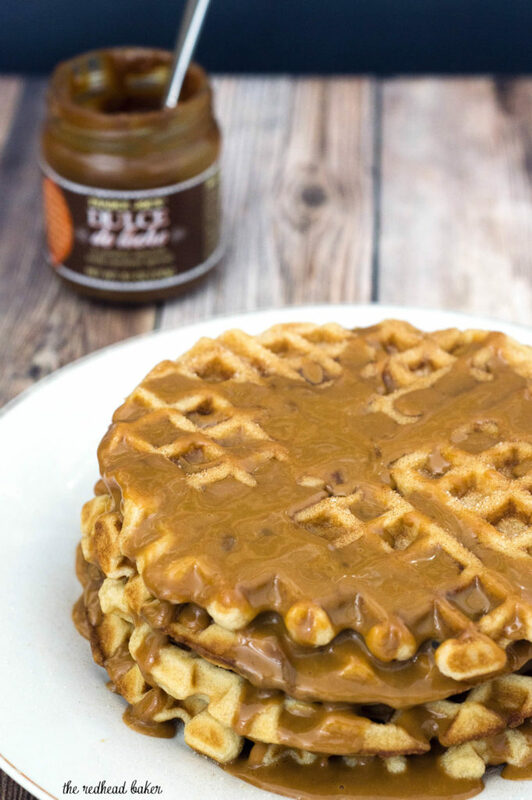 Then, the waffles are drizzled in dulce de leche, a Latin American sauce similar to caramel. 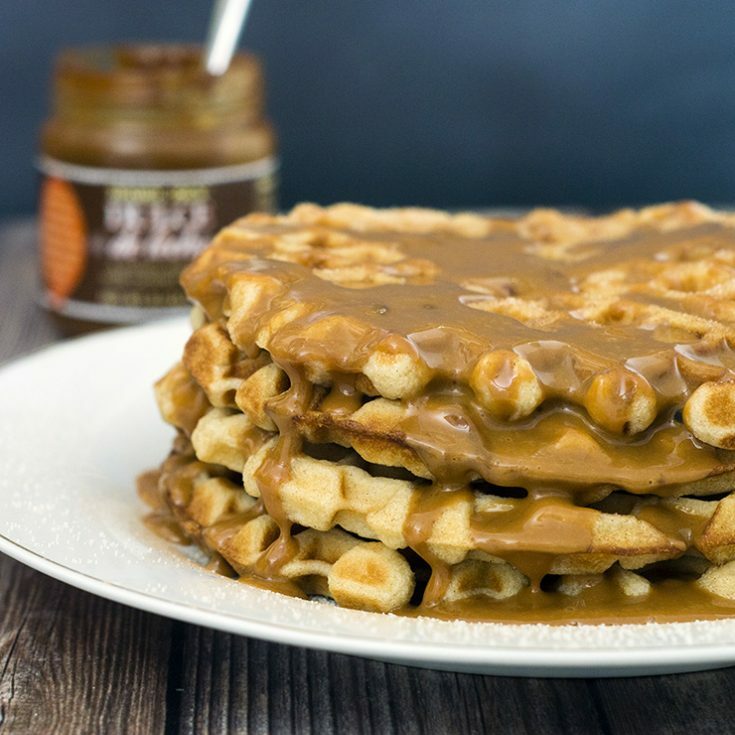 Caramel is usually made with water, sugar, cream and butter, while dulce de leche is made with milk and sugar. If you choose, however, you can drizzle these with regular maple syrup, or even chocolate sauce. 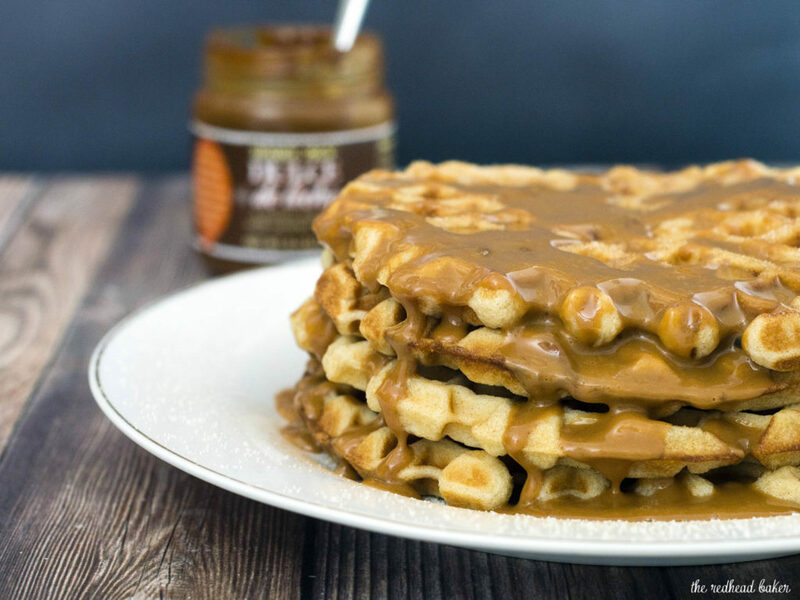 Click here to pin these Churro Waffles for later! In a large mixing bowl, stir together the flour, sugar, baking powder, salt and cinnamon. In a medium mixing bowl, beat the eggs. Add the milk, butter and vanilla to the eggs and beat to combine. Pour the wet ingredients over the dry ingredients, and mix until combined. In a small bowl, combine the sugar and the cinnamon for the topping. Set aside. Preheat your waffle iron. Spray with nonstick spray (if required), and cook the waffles according to the wafflemaker's instructions. 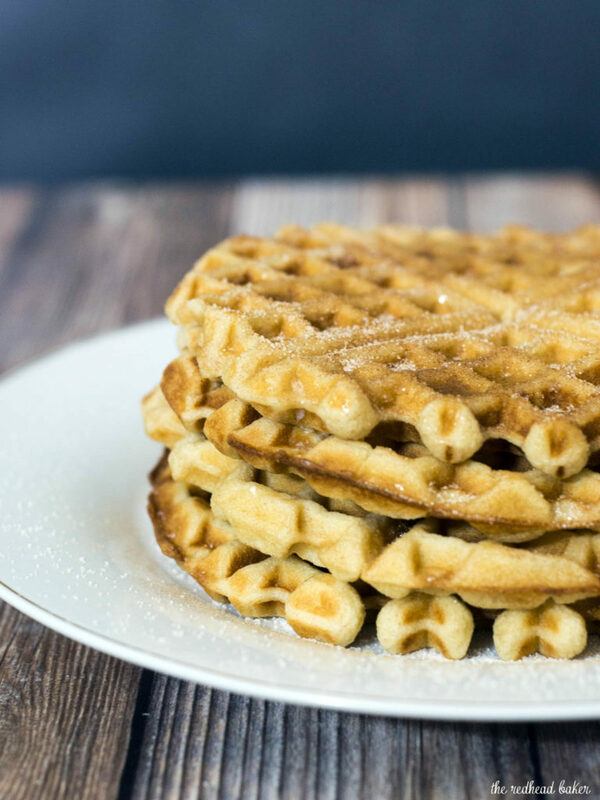 As soon as each waffle is cooked, brush with melted butter, and then sift some of the cinnamon sugar over top. 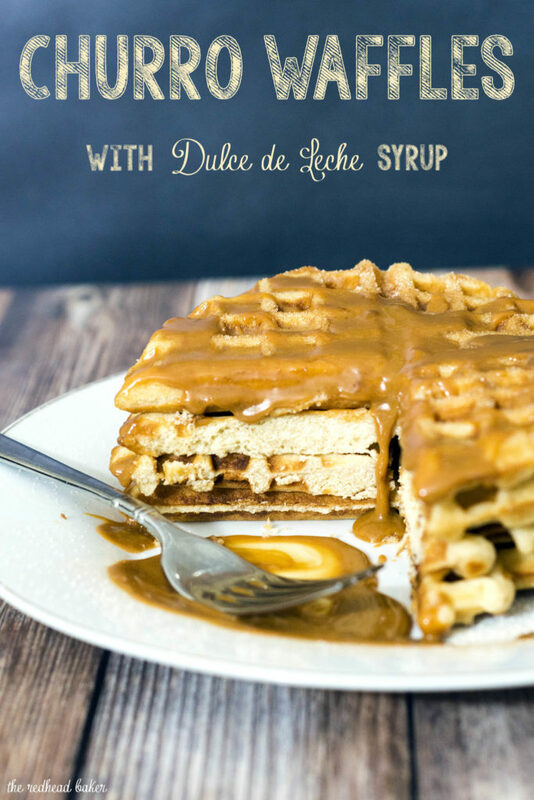 Serve with dulce de leche or maple syrup. Now THIS is a stack of waffles I would dive right into!! Fabulous!!! Oh!!!! I need these in my life!!! **Drooling** How decadent! I definitely need to make these and eat them for breakfast and dessert! I’m sure they are THAT good! You are right, a waffle iron is so fun to have, even when space is limited. And these are beyond tasty! I love the idea of the cinnamon sugar topping! 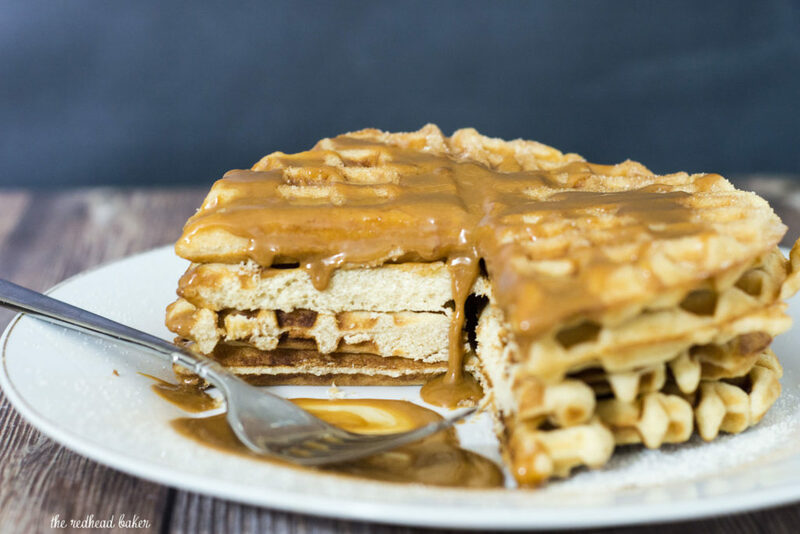 Waffles can always use a little texture and that will make them just perfect. I’m digging the churro taste! These sound wonderful and the Dolche de Leche…YUM! Your toddler’s breakfast sounds about like mine. Though waffles he’ll normally eat. Also on that list is cinnamon, meaning I can’t wait to give your churro waffles a try!